Our client suffered catastrophic injuries including an amputation of his left arm at work while operating a large milling machine into which he fell. We alleged that the employer deliberately disabled the interlock device (“kill” switch) which would turn off the powerful rotational spindle and operating table when the door was opened to inspect the set up. It was alleged that the employer disabled the safety device to increase production speed. We filed a violation of a specific safety requirement(VSSR) application with the Ohio Industrial Commission as well as an employer intentional tort lawsuit in court. The employer also filed an appeal in court when the Bureau of Workers’ Compensation(BWC) and Industrial Commission additionally allowed the injured worker’s claim for a traumatic brain injury. The VSSR claim was settled with the employer for $264,000. The intentional tort claim was settled with the employer and its insurance carrier for $439,000. Unfortunately, the employer had limited assets and the insurance carrier claimed that insurance coverage was negated by an Ohio Supreme Court case. To date, the injured worker has received over $1 million dollars in benefits from the BWC including a 54% permanent partial disability award and loss of arm award. 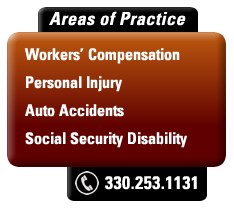 Currently, we are pursuing a permanent total disability award in the Ohio workers compensation claim.